MS Excel to MySQL db converter tool migrate entire table or selected MS Excel database records into MySQL database. Software is useful for organizations which deals in large databases and needs to change MS Excel database records into MySQL db format. Db conversion utility offers database conversion results without applying any database programming. Database migration software relieves programmers and users like DBA from manually converting of the database records. Database migration utility converts source MS Excel database easily in MySQL database format automatically. Easy to use platform of the conversion software allows users to convert MS Excel database worksheets into MySQL database records without any expert database programmer help. Database converter program maintains the db records integrity as it supports all database data types, key constraints and more. Converts MS Excel worksheet into MySQL database records. No need of any learning curve or technical skills to understand the software functionality. 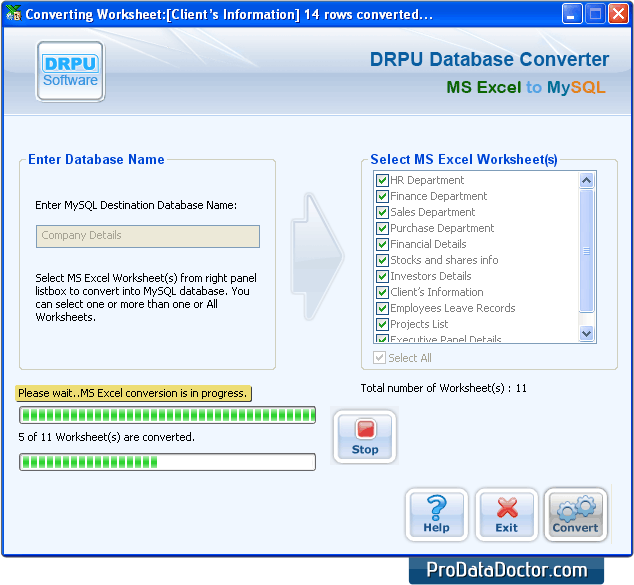 Db converter software supports all major versions of MS Excel and MySQL databases. Permits user to convert bulk databases or selected individual database records. Eliminates the unnecessary wastage of users’ valuable time involved in the complex manual database conversion process. Easily saves converted database at a user specific location on pc for future reference. Software works accurately supporting all major Database key constraints, attributes and data types during database conversion process.